CECILIA BARTOLI RETURNS TO VIVALDI 20 YEARS AFTER HER LANDMARK ALBUM WITH HER NEW ALBUM, ANTONIO VIVALDI, OUT NOW! 26 November 2018 (Toronto, ON) - Almost 20 years after her historic Vivaldi album, Cecilia Bartoli turns to the composer once again for her brand-new solo recording, Antonio Vivaldi. The album, out now via Decca/Universal Music Canada, the country’s leading music company, is a glorious collection of Vivaldi arias performed with the French baroque orchestra Ensemble Matheus under Jean-Christophe Spinosi. This new release also marks 30 years since Bartoli signed to Decca Classics. Listen to Antonio Vivaldi HERE. Cecilia Bartoli’s 1999 recording, The Vivaldi Album, redefined her status as an artist. For the first time, she was widely appreciated as a rescuer of neglected or forgotten music in her dual role as meticulous researcher and passionate interpreter. The Vivaldi Album shone a spotlight on the Italian as a composer of vocal works, sparking a revival in the operas of Vivaldi who had hitherto been primarily known for his concerti. The album sold 700,000 copies in five years and went Gold in six countries. It paved the way for similarly trailblazing releases including the Italian arias of Christoph Willibald Gluck, the legendary castratos (on the album Sacrificium), and Bartoli’s personal 19th Century hero, the mezzo-soprano Maria Malibran. Over the two decades since the release of The Vivaldi Album, the composer’s vocal works have gained a permanent place not only in festival repertoire but also at major opera houses during their regular seasons. The release of several widely acclaimed albums and four previously unrecorded complete Vivaldi operas from 2005 onwards propelled Jean-Christophe Spinosi and Ensemble Matheus to the forefront of the worldwide Vivaldi revival. 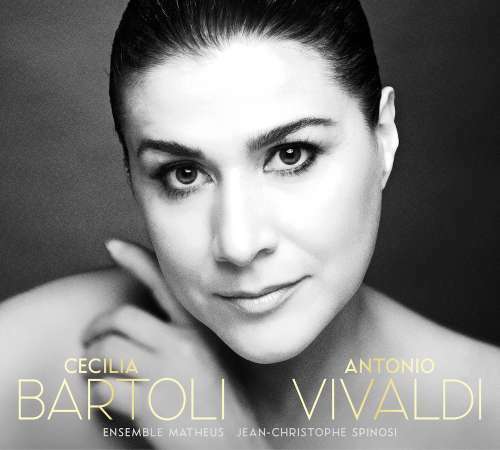 Cecilia Bartoli first collaborated with Jean-Christophe Spinosi and Ensemble Matheus in an all-Vivaldi programme for five concerts in Munich, Prague, Baden-Baden and Versailles – therefore it is fitting that their first studio recording should be exclusively Vivaldi arias. Ten of Vivaldi’s most beautiful arias are presented on this album, nine of them taken from operas that do not appear on the 1999 Vivaldi album. Bartoli’s two Vivaldi recitals thus complement each other and complete her tour through the Venetian composer’s operatic universe. In her 30th year on Decca Classics, Cecilia Bartoli is not only releasing the new Antonio Vivaldi album, but also her first ever box set, The Rossini Edition, and a new label Mentored by Bartoli to nurture outstanding artists – starting with the debut recording of Mexican tenor Javier Camarena, Contrabandista. These three new releases are a testament to Bartoli’s passion for music-making at the highest level and the desire to support a new generation of artists. Antonio Vivaldi pays homage to Cecilia Bartoli as one of the most astounding artists of a generation, combining her work as a performer with that of a highly respected researcher and trailblazer in the world of classical music.